The OAAA, or Outdoor Advertising Association of America, is an organization "Working to promote, protect and advance the outdoor advertising industry". One of the things the OAAA does, is provide its members with Public Service Announcements like the one pictured above. [More Here] These designs are available in almost every imaginable size for every imaginable advertising frame and venue across the united states. Everything from phone kiosks to billboards are available as PDF downloads. The OAAA encourages their members to use these free PSA's when they have empty space and or are trying to fill some PSA quota. Here is what they say about their recent campaign. 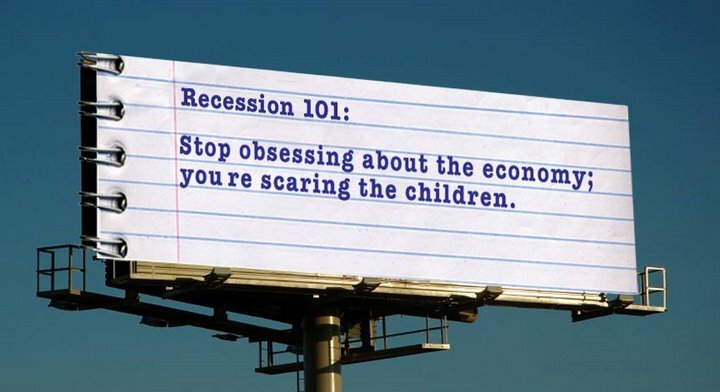 Recession 101 is the latest public service campaign available to OAAA members. OAAA members and printers are encouraged to donate space and materials to post this uplifting and inspirational creative in their markets. While most PSA's are for non-profit and charitable institutions, this recent campaign seems oddly self serving. I know the country is failing and the whole world is falling apart as stories begin to unfold. The advertising industry isn't exempt, and is going through notoriously bad times as companies cut non-essential spending rapidly. To me the these ads look like pleas to corporate America. They ask companies to get back in the game and continue spending absurd amounts of money on promotion instead of building tangible worth. A proper PSA would propose fiscal policies which will help us get out of this current slump as opposed to making light of the problem we are facing. This is what the OAAA has to say about themselves. Any company that sells space for advertising on street furniture, transit or alternative outdoor media displays. Any company or individual providing services or products to the outdoor advertising industry. Includes supplier, financial, and attorney members. Any company or individual using the outdoor medium and/or supporting the goals of the outdoor advertising industry. Includes advertisers, ad agencies, media buying services, highway advertisers, state outdoor associations and other trade groups and coalitions. Any company or individual doing business outside of the United States and interested in the OAAA, and its services. The OAAA's strategic focus is on government relations, marketing, communications, membership, and operations.